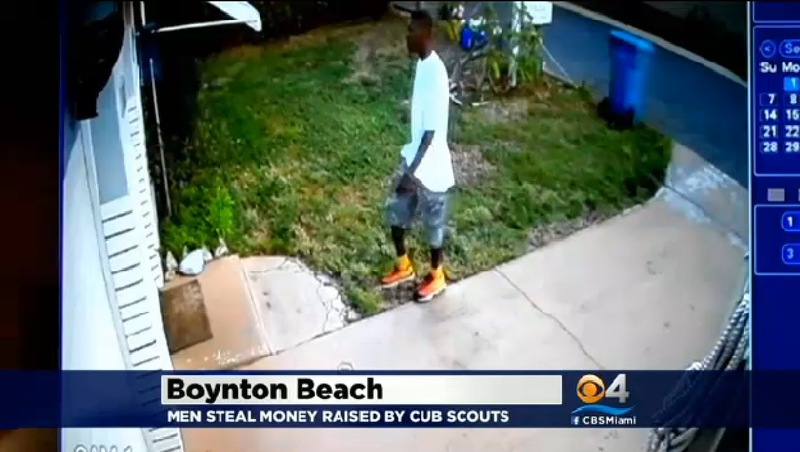 BOYNTON BEACH, Fla. - Police in Boynton Beach, Fla. arrested a man accused of burglarizing a home and taking money from the Cub Scouts in the process, reports CBS Miami. Roderick Kendrick was taken into custody Thursday on charges of grand theft and burglary. Kendrick allegedly stole various items, including a cash box with $550 the Cub Scouts had collected by selling hot dogs and BBQ pork sandwiches, reports the station. Authorities said surveillance cameras captured one man knocking on the door of the residence Tuesday before the burglary. The cameras then captured another man entering the backyard of the residence. On Thursday, the owner of the home was contacted by someone who had seen the surveillance video and said they saw the same person in the video riding his bike in a certain area nearby. The homeowner went to the area and called police saying they recognized the person as the man in the surveillance footage. Authorities identified him as Kendrick. He was ultimately taken in to be interviewed, according to CBS Miami. According to his arrest report, Kendrick denied any involvement in the incident and asked to see the surveillance video. That's when he "changed his story and stated if it was him, he was probably either cutting through the yard to pee or maybe score a little weed," the report said. "It's the best feeling to catch the guy who robbed you," said victim Gina Pleasant. "I worked very hard for that money and I was looking forward for the fall camping trip but it all got robbed," said the child who had collected the money for the Cub Scouts. Officers said they are looking for the second person seen on surveillance. They released a photo of the man in an effort to track him down. Anyone who recognizes the person or has information on the incident is urged to call Palm Beach County Crimestoppers at 1-800-458-TIPS.